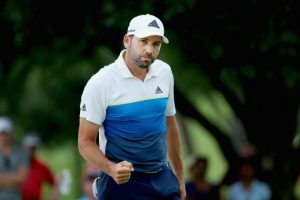 There have been quite a few amazing finishes at the Byron Nelson, but today’s playoff victory by Sergio Garcia ranks up there as one of the best classic finishes in this tournament. Garcia said he appreciated an “emotional” exchange with Peggy Nelson, widow of the tournament namesake, after becoming the first golfer to post multiple Nelson victories at the Four Seasons venue since the event moved to Irving in 1983. Garcia who plunked two balls in the water certainly looked as if he going to choke in the final round made the afternoon of flawless golf by Brooks Koepka a distant memory as he hoisted the trophy. Perhaps the most disappointing finish of the weekend came from local favorite and the most likely player to take the hardware in Jordan Speith. Spieth, the No. 2 player in the world golf rankings, found just 9 of 18 greens in regulation Sunday. He made six bogeys during a closing 74 that marked Spieth’s highest score at the TPC Las Colinas since a closing 75 as a tour rookie in 2013. Spieth finished in a tie for 18th place at 10 under despite playing in the final group at the Nelson for the first time as a tour participant. Koepka, who missed a 16-foot birdie putt on the 18th green that could have won it in regulation, just muffed the playoff hole with a double bogey. After driving into the water and taking a drop, his approach from the left rough landed well short of the green and provided the opening for Garcia. Koepka called it a continuation of a recurring theme during weekend rounds. One of the biggest mover and shakers of the weekend was SMU alum and Dallas product, Colt Knost, who finished with 65 today and -13 for the tournament. “It’s great to have a finish like this in your hometown, it is sort of dream come true to be up here on Sunday with some of these guys,” said Knost. Garcia won the 2016 AT&T Byron Nelson victory at 36 years of age. His most recent TOUR win being the 2012 Wyndham Championship. With today’s win, Garcia earned 500 FedExCup points and jumped from No. 48 in the standings to No. 12.